M.E.C.’s broad-wall multi-hold directional couplers consist of rectangular waveguide primary and secondary lines with a common broad-wall where high directivity coupling is achieved over the full waveguide band by a Tchebyscheff multi-hole coupling structure and a precision termination in the secondary arm. 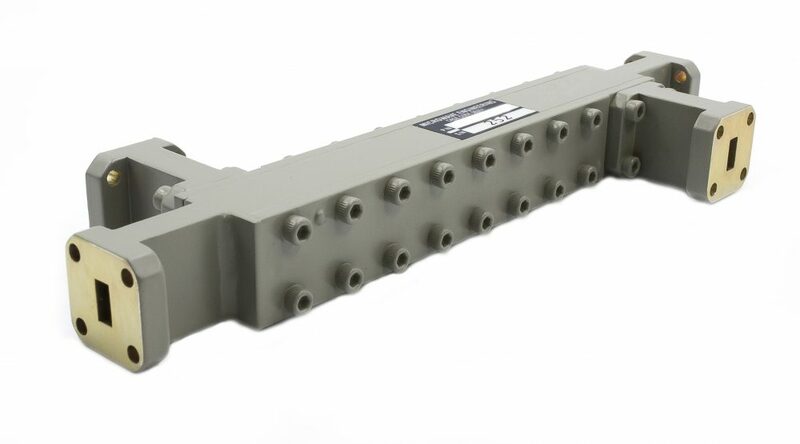 Waveguide cover flanges are provided on the main line while secondary lines are available with either cover flanges or coaxial connectors. Both single directional (160 Series) and dual directional (200 Series) couplers are optimized to balance electrical performance with a compact design. These couplers are ideal in reflectometer set-ups to measure VSWR’s as low as 1.04:1 over full waveguide bands. They are also well suited as samplers in leveling loops or as power dividers and combiners. Aluminum units are chromate conversion finished per MIL-C-5541, Class 3, while all other units receive corrosion-resistant coatings. All units are painted with gray epoxy enamel on external, non-mating surfaces. Frequency Sensitivity ±0.5 dB Max. (3) Other coupling values from 3 dB and up are available. Over-all length may vary. (4) Other frequencies, directivity, style, and power options are available. All customer designs are welcome.